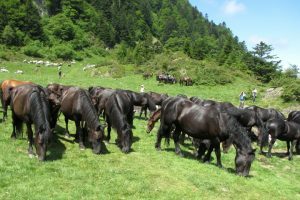 Just as most people are unaware of the presence of brown bears in the Pyrenees, so the existence of two native breeds of horse in the Pyrenees is not widely known. However, for millenia, the rugged mountain environment of the Ariege department of the central Pyrenees has been home to two specific breeds. These are the Merens and the Castillonais horses. Paintings of horses in prehistoric caves appear to resemble these stocky animals. This suggests that they may have been present in the area way back in 13,000 BC! However, in the course of the 20th C both breeds were threatened with extinction as the pure blood lines dwindled. 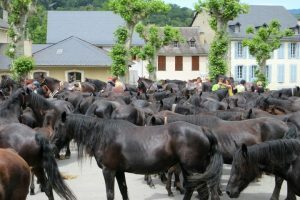 But thanks to concerted local efforts over the past 20 years, populations of both the Merens and the Castillonais horses are once again on a healthy level. At first glance you could be forgiven for mistaking the Merens for a British a fell pony. The resemblance is striking with its jet black coat and shaggy mane and fetlocks. 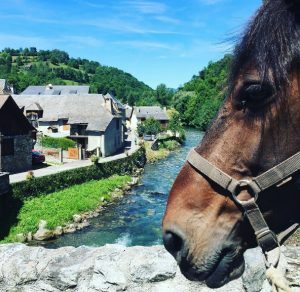 However, this small, rustic horse is native to the Pyrenees and in particular to the rugged mountains of the Haute Ariege in the centre of the chain. In days gone by, the Mérens was put to work in areas that could not be accessed by other equipment. Their jobs would include hauling timber, undertaking draft work in mountain mining areas and also pulling ploughs and other equipment in farming communities. Their other main use in the 19th and 20th centuries was as a pack animal. They would transport goods over mountainous routes into Spain and neighbouring valleys where trading took place. Today in some areas they are still used to transport supplies from the valley up to the high mountain refuges. They’re much cheaper than a helicopter! This lovely natured horse is perfectly at home in the mountain environment. The Merens is a sure-footed animal with excellent endurance. 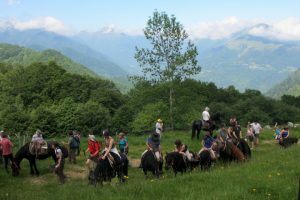 No surprise then that they are, the horse of choice for long distance horse riding holidays in the Pyrenees mountains. They are a versatile, hardy breed, perfectly content to live outside year round with little care. 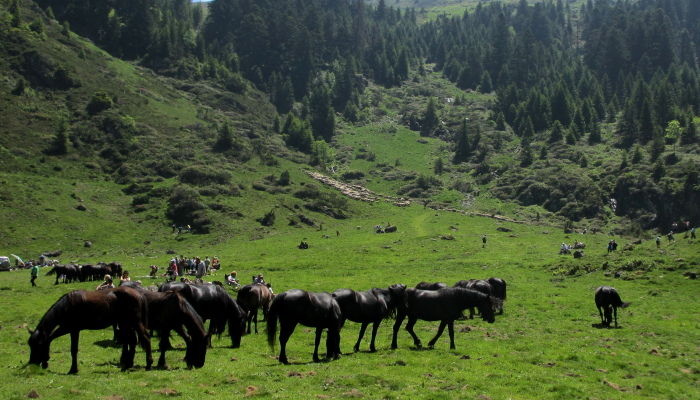 In early summer, typically the second week of June, the Merens undertakes an annual migration in an event called the Transhumance. It’s an occasion on which the Merens breeders move their horses from their winter quarters in the valleys, back up to the high mountain pastures (around 1500m alt). There, they will enjoy the lush grass and roam freely in a semi-feral state with their foals until they are brought back down to the valleys in mid October before the first snows arrive. The Transhumance is one of the highlights of pastoral life in the Ariege Pyrenees. It’s a fantastic celebratory event in which the horse-loving general public can take an active part. Along the way you’ll be entertained by traditional musicians, singers and dancers. When you finally arrive in the high pastures you’ll enjoy the most delicious meal of local produce, washed down with local wine! Places for this exceptional experience not surprisingly fill quickly, so do get in touch with us without delay to secure your space. The mountains of the central Pyrenees are also home to a second native breed of horse, the Castillonais, also known as the Cheval Ariegeois de Castillon. This is an ancient breed of small riding horse originating in the Ariege department. It is dark bay or black in colour and with a distinctive lighter colour around the eyes and muzzle. Like the Merens, this horse was bred for working in the mountains and is well adapted to the rugged terrain. The majority of the Castillonais breeders are centred around the village of Castillon-en-Couserans in the west of the Ariege department. 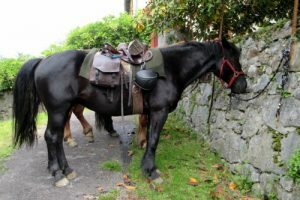 The Castillon breed is regularly used for horse trekking as, like the Merens, it is a good-natured and sure-footed beast, perfectly adapted for long days in the mountains. We’re delighted to work with stables in the Ariege Pyrenees that breed both the Merens and Castillonais horses. Over the course of a 5 day horse riding holiday they’ll share their passion with you and I can guarantee you’ll quickly fall in love with these beautiful animals too.